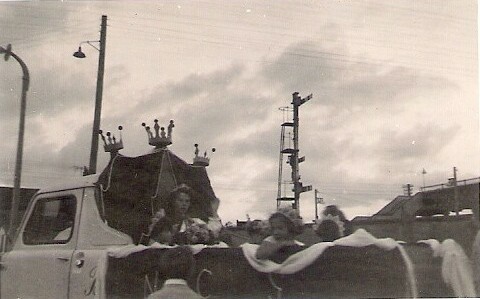 Three of photos of Newhaven Carnival. The top shop has the Newhaven Drug Stores in the background run by Mr A. Bridger. Can anyone help name the year or recognise anybody in the pictures, as I have no knowledge. This page was added by Mel Allen on 07/09/2018. I remember Ron Bassett a local builder had a truck the same as that in picture. Hi Brian, Do you have anything more you can share about Ron? He sadly passed away in 2012. 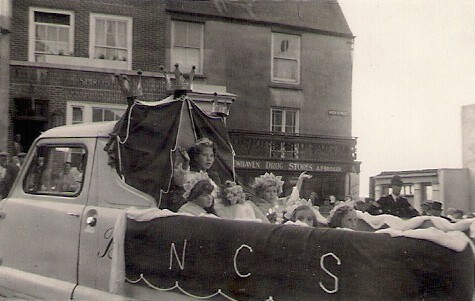 The girl peeping over the side of the lorry in the first photo I'm pretty certain is my sister Marian Kennedy (nee Evans). The attendant in the second photo is Alexia Kennedy, sister of Stewart who owns Dees. 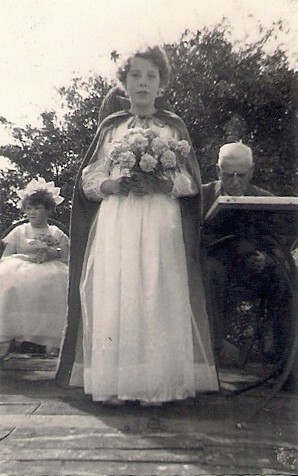 Marian married Stewart and so Alexia became her sister-in-law. Sadly Marian died in 2010. Bassett's truck is a Standard Atlas; these were introduced at the 1958 Commercial Motor Show, so these photos must have been from 1959 at the earliest. Mr. Bridger's shop was later taken over by Mr. Joe Funnell, who sold radios and TVs, also sacks of dog biscuits and other animal feeds, a rather strange combination! Can anyone identify the structure in the background, behind the policeman in the first picture? I seem to remember it but probably never knew what it was for. What ever happened to the Newhaven torchlight procession?